The City of New Port Richey's Water Reclamation Facility was selected for both the 2011 and 2005 Operation and Maintenance Excellence Awards from the Florida Department of Environmental Protection. The City of New Port Richey, in response to public health and environmental concerns, constructed its first wastewater treatment and collection system in 1927. This system consisted of 18,000 feet of wastewater pipeline and a large septic tank with a discharge line to the Pithlachascotee River. The system provided only minimal treatment by today’s standards. This system remained in place until 1963, when a new wastewater treatment plant was constructed at the west end of Main Street. Since that time, the facility has evolved into a state-of-the-art treatment facility. In order to meet stringent state and federal treatment standards and to keep up with growth, the plant has been upgraded five times since 1983. The cost to date is in excess of $30 million. Our Water Reclamation Facility is the largest in Pasco County. It is capable of treating up to 7.5 million gallons of wastewater a day. Our plant processed over 2 billion gallons of wastewater last year to near-drinking-water quality. The treatment process removes 99.3% of pollutants. It costs $3 million dollars per year to operate the plant. All treated water is pumped to the master reuse system for beneficial re-use. City parks, golf courses, schools and residents all use treated water for irrigation purposes. The City of New Port Richey uses about 1 million gallons per day, and the balance (about 4.5 million gallons per day) is pumped to Pasco County Utilities for distribution throughout the County. We have 17 highly trained employees that staff the plant 24 hours a day seven days a week. All operators are tested and certified by the Florida Department of Environmental Protection. Our staff has more responsibility than what would normally be expected at other medium sized utilities. Very little of what we do is contracted out. We have a NELAC certified laboratory, the entire 15 acre site is maintained by staff, including the buildings and grounds. We have a full time truck driver that transports about 6 million gallons of sludge to the county every year. We also have a fully equipped work shop that allows us to make most equipment repairs in-house. Performing work in-house allows for quick turn around, gives us more control over costs, and provides for a higher level of service. Staff always takes the initiative to make small equipment upgrades or modifications that will improve process reliability and plant performance. 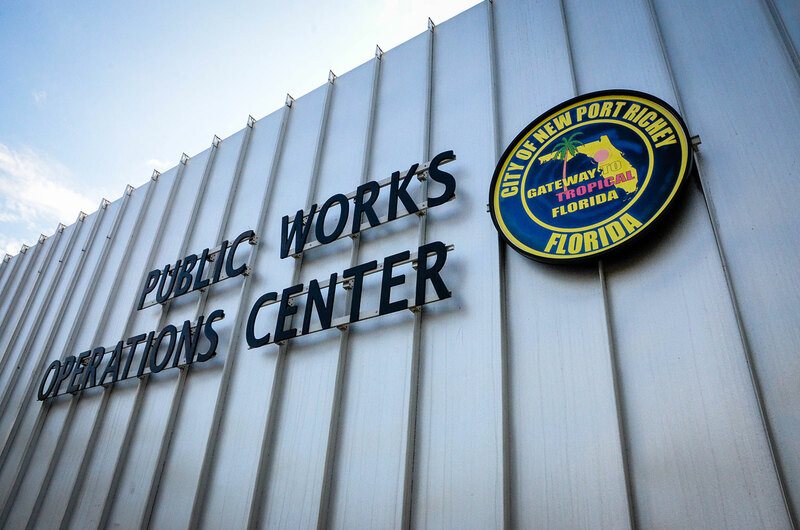 The city receives flow from four other entities located outside of New Port Richey. This arrangement has been instrumental in protecting the environment from a regional perspective and is an example of the kind of regional cooperation that is essential for efficient wastewater treatment and disposal. All involved benefit, such as the outside utilities that send flow to us do not have to invest in capital for treatment facilities and the revenue generated, about $1.2 million per year, aids in keeping user rates as low as possible.